Hope you all celebrated Karthigai Deepam very well. We celebrated it by lighting diyas. We don't have a custom of preparing sweets to offer god on this day. But, I wanted to post something that I prepared some time earlier. 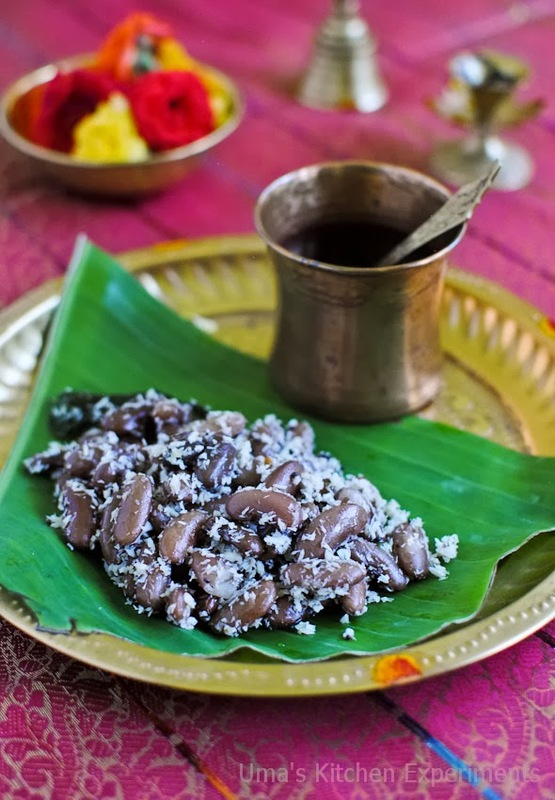 This dish, Rajma sundal along with Green gram sweet sundal and aval vada were prepared on the day of Saraswathi Pooja. I got sometime to click the pics of sundal on that day and planned to post it on the same day. Few works made me busy that day as usual and so I paused blogging for a while and waiting for an apt occasion to post it. But today I decided to post this dish as I felt it can't be in a dormant state for a long time. Better late than never. Am I right? 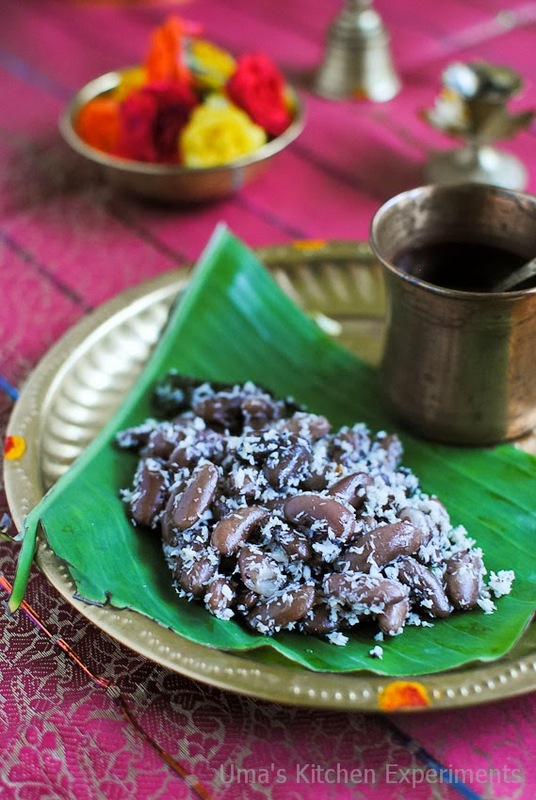 1) Soak rajma beans for 8 hours or just soak it overnight. 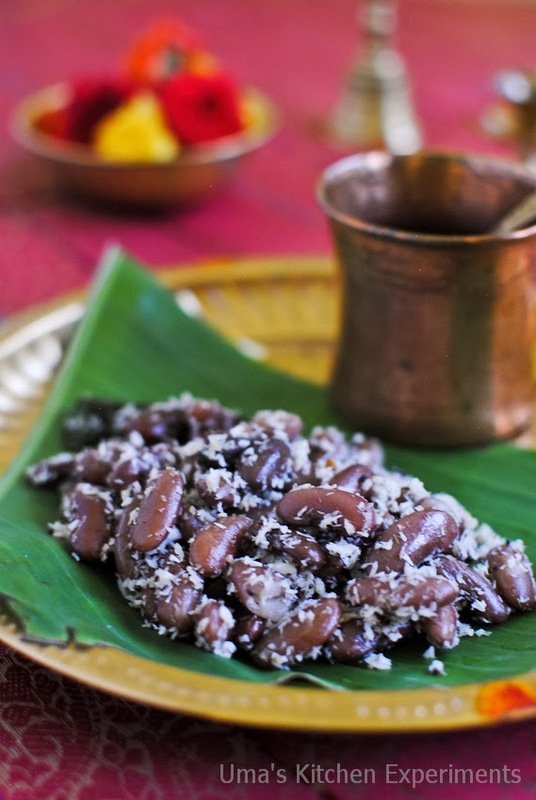 2) Pressure cook it by adding enough water (just to immerse rajma) and salt for 3-4 whistles. 3) Once the steam releases well, drain the water from it and keep aside. 4) Heat oil in a pan. Add mustard seeds when it is hot. Allow it to splutter. 5) Add asafoetida,dry red chilli and curry leaves. Saute for few seconds. 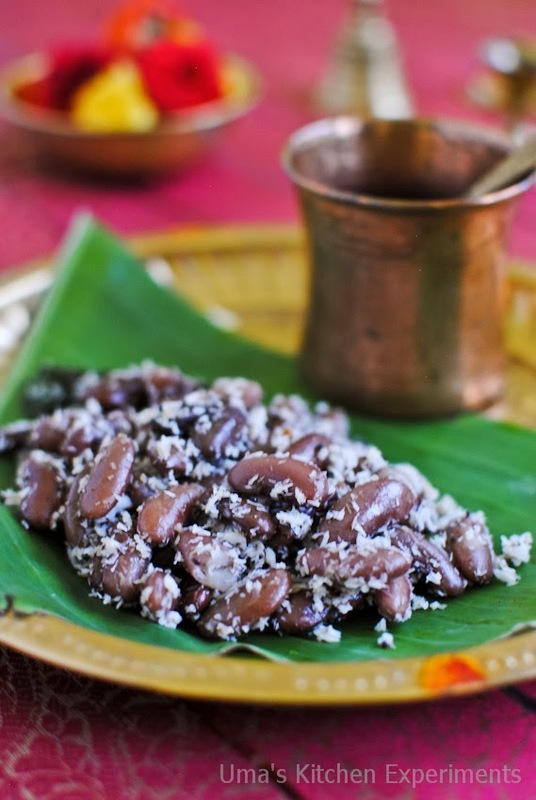 6) Add cooked rajma. Mix well. 7) Add grated coconut and turn off the stove. Mix well again. 1) The Rajma I used cooked well only in 4 whistles. You may require only 3 or need 4 based on the quality of the rajma. 2) You can also add grated ginger to this. 3) I turned off the stove once I added coconut. If you want to keep this sundal for long time, then saute the sundal for few more minutes after adding coconut. Increase or decrease the coconut quantity as per your liking. Wow it looks so divine uma it's very nice lovely shot semma color combination. Tasty sundal. Love the clicks. like your presentation uma.. perfect festive styling..